Home » Brissot de Warville, leader of the Girondins. Jacques-Pierre Brissot de Warville called Brissot, publicist and journalist, was the Jacobin and later leader of the Girondins, a grouping of moderate Republicans during the French Revolution. In Paris he dedicated himself to scientific studies, particularly in the field of chemistry. The theory that property is theft, which would later be famous for Pierre-Joseph Proudhon 1809–1865 (French politician and the founder of mutualist philosophy), forms the central thesis of his book Recherches Philosophiques Su le droit de propriété & sur le vol, considérés dans la nature & dans la société (1780). 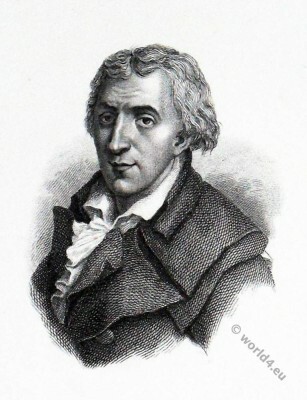 Brissot wrote simultaneously pamphlets entitled I’inegalite sociale. From 1782 to 1786 his ten-volume Bibliothèque philosophique du législateur appeared which was based on the ethical principles of Rousseau. Beginning September 1792 Brissot was elected by the Eure-et-Loir in the National Convention. He and his friends, the Brissotins, fought against the policy of the Jacobins, and against anarchy. In October they were excluded from the Jacobin Club. Brissot attacked the Parisian sections, the Paris Commune, the Montagnards, especially Robespierre. First he fought against the death sentence for Louis XVI. ; in the trial of the king he finally voted for the death penalty subject to the approval of the guilty verdict by the people and the postponement of the execution until the peace. In April Robespierre accused him of complicity in the treason of General Dumouriez. Brissot struggled in May with a writing in which he called for the closure of the Jacobin Club and the dissolution of the Paris Commune. On June 2, he was arrested and the house arrest was decided. Brissot fled and came to Moulins in the Auvergne. There he was discovered and arrested; on June 22 he was imprisoned in the Abbaye Paris and then in the Conciergerie. In prison, he wrote his memoirs under the title Legs à mes enfants. On October 30, 1793 Jacques-Pierre Brissot de Warville was sentenced to death along with twenty-one Girondins from the revolutionary tribunal. At the age of thirty-nine years, he died the following day on the Place de la Révolution by the guillotine. Portraits by people during the French Revolution.